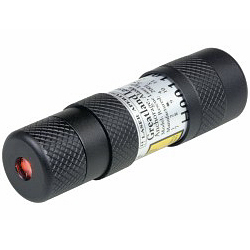 Day and nighttime laser signaling device that provides a convenient, effective way to signal a rescue party. Now with a sight ring that helps you aim at your target, use this compact laser flare to signal for help or locate crew or gear. Laser flare emits a fan of light rather than a narrow beam. Visible up to 20 miles away at night, visible up to three miles in daylight and locates reflective material up to one mile away. Long-life red laser diode lasts up to 10,000 hours. Greatland Rescue Laser Flares use patented technology to create a line of laser light that when "painted" across an area guarantees that you will hit your target. In a survival situation, the ability to easily signal across large distances is the key to getting rescued. By drawing a vertical fan of light that spreads thousands of feet long at miles of distance, even under duress, it is easy to make sure that your signal catches the eye of a possible rescuer. In addition, by diffusing the laser from a potential dangerous point of light into a spread out line, your target will see a brief, but bright, momentary flash as the laser line crosses their field of vision. At distances of 13 feet or more, the Rescue Laser is perfectly eye safe, yet incredibly effective from up to 30 miles away. With a common laser pointer, you would have to hit your target directly in the eye for them to see you. At a distance, this would be nearly impossible. Rescue Lasers work because at a distance they produce a fan or light. At 16 miles, the fan would be 6,000' high. Note: This fan of light will not be visible. The target will see a brilliant flash of light only when the fan crosses their line of vision.